In a pan, heat ghee and add cinnamon stick, star anise, cloves, cardamom and stir for a minute then add chopped onions fry until translucent. Now add in ginger garlic paste, mix well and add chopped tomatoes and cook until tomatoes turn mushy. Then add green chilli, chilli powder, coriander powder, turmeric powder, fennel powder and cumin powder, mix everything together so that the spices incorporates well and add in chicken drumsticks, half a cup of water. Let all this cook on medium flame until the chicken is cooked and the liquid is evaporated. Now add in boiled eggs, 70% cooked rice to the chicken mixture mix everything well and pour in the balance water, adjust seasoning and cover to cook until rice is fluffy. Mix in coriander and mint leaves to the rice and cover for a couple of minutes so that the flavor will be infused in the rice. Finally add in cashews and raisins that have been fried in ghee to garnish. 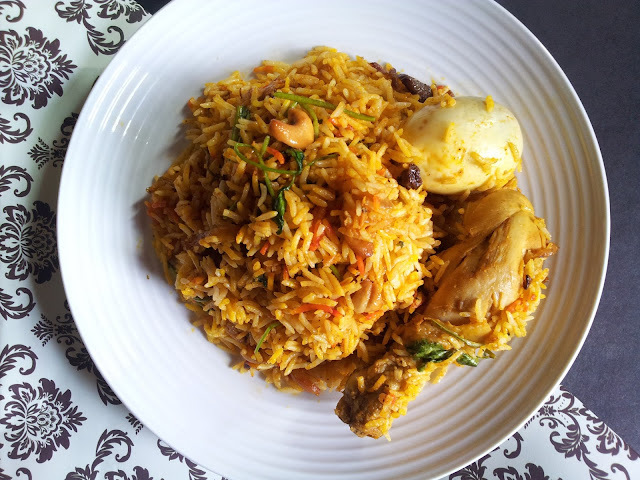 Now our Spicy Chicken Briyani is ready to be served. Do try and let me know how it turned out for you! Superb! very tempting yummy biryani. Am drooling over that plate of irresistible briyani sis, makes me hingry even after my dinner. fantastic,wish i could have this ,rice is cooked beautifully. Dum biriyani looks delicious Arthy, great meal. looks so delicious and perfectly done ! 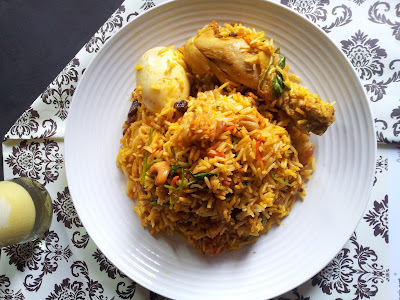 Your chicken biryani looks fabulous Arthy. I am drooling over here. Simply superb dear. Its just inviting. love it any time.pass me sum plz.